I'm testing a transmitter-receiver circuit using the low-cost RF ones mentioned in this thread. I'm a little bit confused regarding how to configure the pins of the ATtiny 13 as input. Normally, when the pin is configured as input, without pull-up resistors enabled, it is tri-stated in High Impedance state. 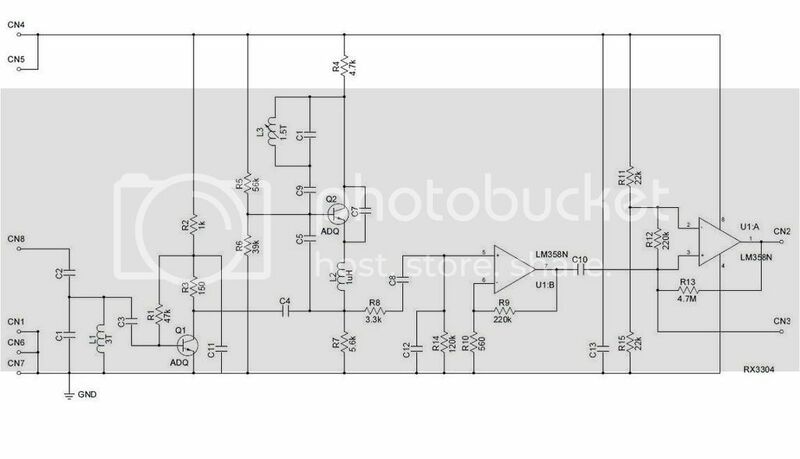 So my question is: Do I have to connect a pull down resistor to the input pin of the microcontroller to make sure that it is at logic "0" when there's no data from the receiver ? From the circuits you've worked with, how do you connect the pins of the microcontroller which is to receive data from the receiver: pulled-up or pulled down with a resistor? Most likely, the digital output from the module is push-pull, so you simply connect it to the MCU input with a straight wire with no resistors (may be a resistor in series for protection). But, of course, you should read the data sheet for the specific module to know for sure. First of all, I apologize for my bad English. I will try to make small sentences. Sensitivity or noise. What happens? I bought some same kits from Ebay as shown on Mr RB's site. I did not use it yet but I turned on the receiver. Frequently I receive some noise at the output. 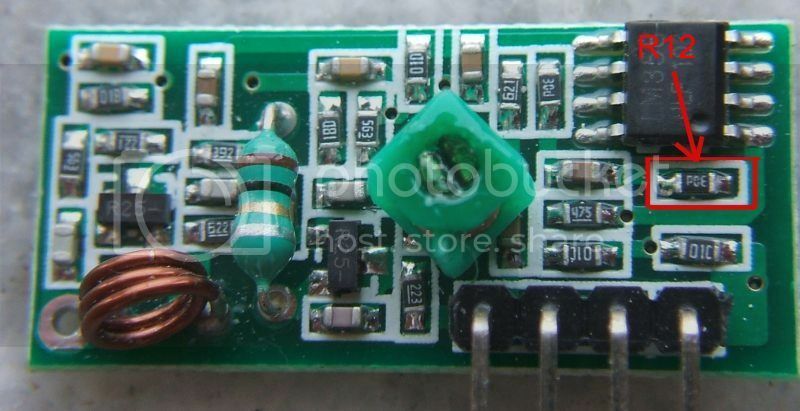 I tried to understand what was going on, so I made a search on web and finally I found the circuit of the receiver. 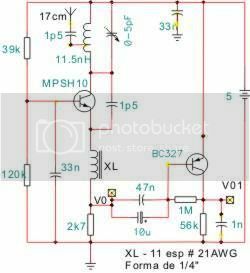 I analyzed the diagram and I measured what was going on the comparator’s input. I found those signals showed bellow. Normally the instantaneous voltage of noise almost reaches the reference voltage. 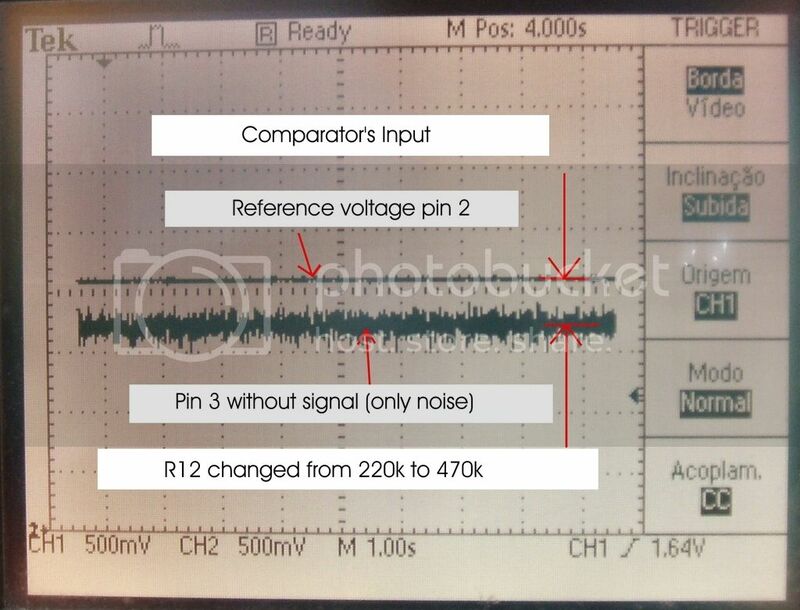 Occasionally it goes beyond the reference voltage and the output of comparator goes high. I changed the value of R12 from 220k to 470k. See below. Now the difference between the instantaneous voltage of noise and the reference voltage is bigger. I monitor the output of the receiver for 10 second and did not find any noise. The value of R12 can be changed to 330k, if the earlier change was too much. You have reduced the sensitivity of the receiver to valid signals as much as you have reduced the propensity for no-signal noise. As a valid signal gets weaker, it will decode incorrectly, and begin to mimic the no-signal noise, so the messages must be short, and contain redundant information so the message can be recovered, or at least validated (ECC or Parity). I know that I reduced the sensitivity. But what would be the best signal to noise ratio of a data receiver? Many years ago I projected a fiber optic receiver to receive weak data signals. As I had not experience, the gain of the receiver was big and noise signals became present. In other words my receiver had much sensitivity but had much noise too. When I reduced de gain I could measure the error. During one month I sent and received (two transmitter-receiver modules) more than 5.e12 (2e6 * 60 * 60 * 24 * 30) pseudo random bits without one error. I know that I reduced the sensitivity, but if you have sufficient signal you may reduce the gain. 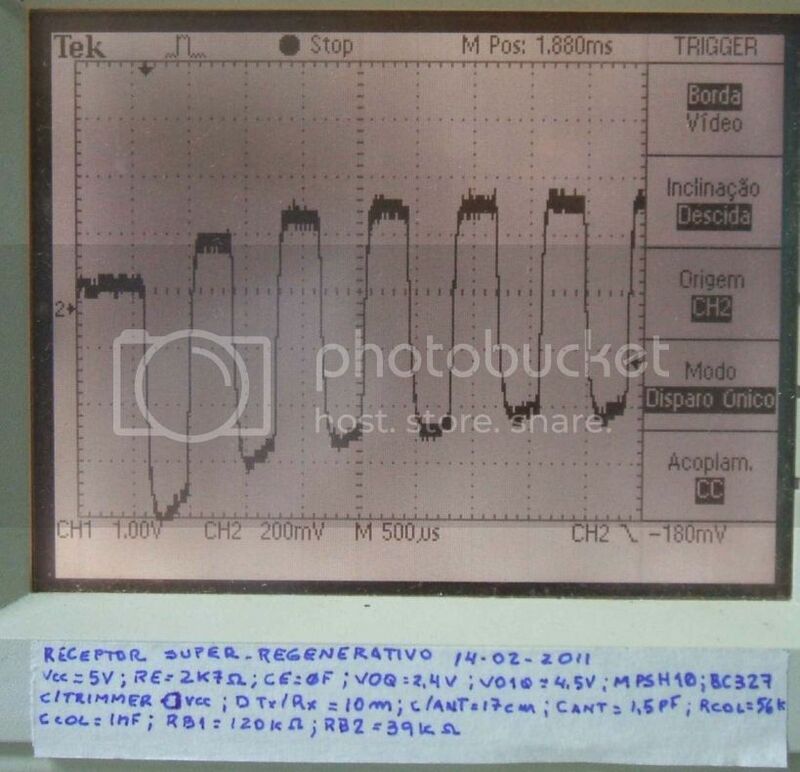 I know that with super regenerative (SR) receivers is necessary to transmit a preamble right away before data to adjust the operation point of the RF transistor. Below you can see the preamble changing the operation point of the RF transistor in a SR receiver that I projected. The 433MHz part of the receiver which catches the preamble. In my application I want to receive one byte per hour (it is a water level system) or always its level changes one step. I have to keep my uC as much as I can at sleep state until it receives data, not noise. With the presence of noise the uC awakes many times and it consumes a lot of electric energy. PS. I will not continue with my receiver project. I will try to use the kit. 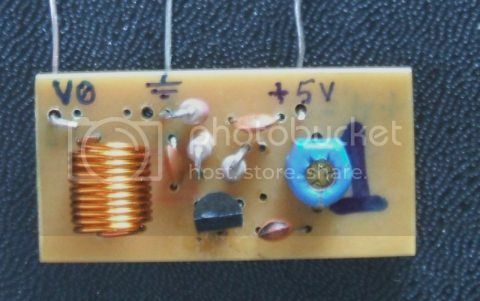 hello is a pleasure to be part of the forum, I am new to electronics, I'm trying to understand the code of RomanBlack friend, this code can decode reception sender and image control ?? // or the function will not exit. There is no timeout feature, but could be added. // global variable; unsigned char rxdat holds the 10 byte result. rrp_period = TMR0L; // grab the pulse period! if(rrp_period >= 100) break; // if >=200uS, is unexpected start pulse! rrp_bytes = 0; // reset bytes, must run from start of a new packet again! or I can redirect data to hyperterminal? I just saw this thread and have a comment. On the project page, about 1/4 down from the top, are scope shots of the receiver output for three different modulating frequencies. The conclusion is that there is a receiver problem causing duty cycle distortion at higher data rates. I respectfully submit an alternate interpretation of the data. 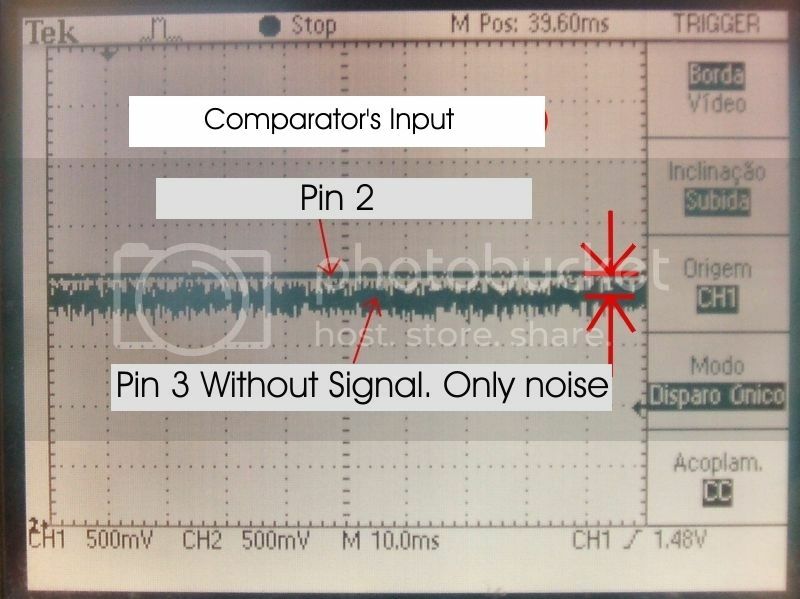 At 1.00 kHz, the output duty cycle is 47%, a 3% distortion. But that also is a 30 us distortion. At 10 kHz it looks like the duty cycle is about 25%. But, if you measure the positive pulse width, add in the 30 us distortion from the slower waveform, multiply by 2, and invert, you get 9.1 kHz. This suggests to me that the duty cycle distortion is caused mostly by the startup time delay of the transmitter, which is completely off during zero states, and is a constant that is relatively independent of the modulating frequency. I suspect that there is a similar constant time delay distortion caused by the receiver at the end of a received pulse. In no way do I think that this is the whole answer, both because RF never is simple and because cheap parts are, well, cheap. But I wonder what the modulated RF envelopes look like superimposed over those three input data waveforms with the scope triggered on the data, and superimposed over the output waveforms with the scope triggered on the RF. They might show the two processing delays I'm theorizing, and suggest a pre-distortion that can be calculated automatically for any input data rate to improve system reliability. What every day life purpose is the transmitter & receiver good for? What is 433 MHz and 315 MHz used for in every day life? What distance will it transmit? What every day life purpose is the transmitter & receiver good for? What is 433 MHz and 315 MHz used for in every day life? They are license-free (ISM) bands for just this purpose. Only infrequent, very low power, short duration transmissions allowed, no voice, no continuous broadcasts. What distance will it transmit? With good antennas, a few hundred feet. With crummy or no antennas, a few feet. I thought those were the CB radio bands? CB radio is roughly the 11 meter band. 27 Mhz. I have a small doubt detecting your Very First start pulse on receiving packet data. By detecting Hi to low (Falling edge) you start TMR0 & it will start counting the pulse period until another falling edge is detected. On the very first receiving start pulse, there is no falling edge to start the timer (Reset TMR0). The very first falling edge will appear after the High period of 80uS of the start pulse. At that time the TMR0 value is invalid because not RESET after a previous falling edge (There is no any previous falling edge on very first). Because these modules in idle state it stays in logic low. The attached code is waiting for a valid start pulse, but it will never achieve. You got it what I mean...!! I think you need a preamble byte (Like 12mS High pulse to settle gain & reset TMR0) to be send first prior to send the data packet with start bytes. rrp_period = TMR0L;           // grab the pulse period!